Lorenda Overman graduated with an associate degree in science from Mount Olive College. Afterwards, she and her husband, Harrell, formed a corporation with his mother and father. Lorenda and Harrell have worked with swine and row crops for 34 years. Their farm is diversified with row crops of corn, wheat and soybeans. Their topping floors now have 7,000 head and their sow farm has 2,000 sows. Lorenda’s work with the farm operation is primarily in office operations and management. 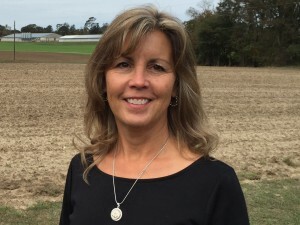 She is a member of the Women’s Committee for the Wayne County Farm Bureau, the current past chair for the NC Farm Bureau State Women’s Committee, and serves as a member of the American Farm Bureau Women’s Leadership Committee – representing the Southern Region. Through the Farm Bureau “Ag in the Classroom” program, she helps educate community children about agriculture. Lorenda also serves on the E-Team for the NC Farm Bureau, and the GO Team for the American Farm Bureau, helping keep the elected county officials in touch with the agriculture community. Lorenda is a member of the Wayne County Agricultural Board and works with the Wayne County Extension Service on the “We Dig It” campaign for Wayne County agriculture. She is a Past Commander of the Goldsboro Sail and Power Squadron, where she has served on the Bridge as an officer for the past 10 years. Lorenda and Harrell are members of Providence United Methodist Church where she sings in the choir, occasionally plays the organ for services, and teaches Sunday School. Lorenda enjoys being outside, swimming, boating, fishing, and being with their three children and two grandchildren.